Utah Democrats at the party's 2017 organizing convention. Ahead of the Utah Democratic Party’s state convention this weekend, the party leadership has issued a friendly challenge. The state GOP Convention on April 21 was dominated by hours of arguing among delegates over rules and proposed bylaws. Cragun admits the weekend won’t be completely without “spirited and civil” debate. More than 2,000 party delegates will meet at the Salt Palace Convention Center in downtown Salt Lake City to decide who will represent their party in federal races on the November ballot. They’ll also update the party’s platform. The largest field of Democrats is in Utah’s 4th Congressional District, where the Democratic nominee will square off against Republican incumbent Mia Love. Frontrunner Ben McAdams has raised over a million dollars in that race — far more than his four opponents. He faces democratic opponents Darlene McDonald, Tom Taylor, Sheldon Kirkham and Morgan Shepherd. 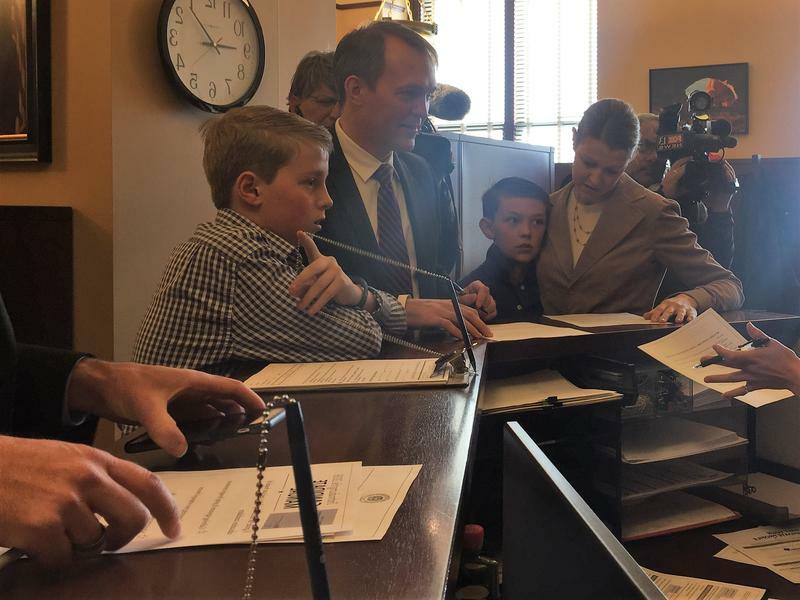 Four other Democrats are running for Utah’s open Senate seat, including progressive candidate Mitchell Vice and Salt Lake County Councilwoman Jenny Wilson, who has raised half a million dollars so far. Jeff Dransfield and Larry Livingston are also seeking the Democratic nomination for U.S. Senate. Candidates need to earn support from 60 percent of delegates to avoid a primary. In Utah’s 1st Congressional District, Lee Castillo and Kurt Weiland will compete for the Democratic nomination. The winner will face incumbent Republican Congressman Rob Bishop in the general election. Democrats Shireen Ghorbani and Randy Hopkins will try to win their party’s nomination in Utah’s 2nd Congressional District. Rep. Chris Stewart won the Republican nomination in his re-election bid for the seat. Two Republicans — incumbent Congressman John Curtis and challenger Chris Herrod — were forced into a primary at the GOP convention last weekend. Democrats James Signer and Kent Moon will try to avoid a similar outcome as they compete for the Democratic nomination on Saturday. Delegates will also hear a keynote speech from vice-chair of the Democratic National Committee Michael Blake. Recent gains by Democrats in special elections across the country have some Republicans worried about an anti-Trump wave come November. In Utah, a solidly red state, that looks less likely, but it hasn't stopped Democrats from fielding more candidates for statewide races. Long simmering tensions in the Utah Republican Party bubbled over at the party’s state convention this weekend. Some delegates worry that the infighting threatens to further undermine the caucus-convention system.